For the first time since its designation after the Boston Marathon bombings, One Boston Day falls on Marathon Monday. One Boston Day, falling on Marathon Monday this year, is a day of service in the city on the anniversary of the marathon bombings. One Boston Day falls on Marathon Monday this year, but people and organizations aren't waiting until then to show gratitude. The day, which is designed to encourage random acts of kindness, started after the Boston Marathon bombings in 2013. 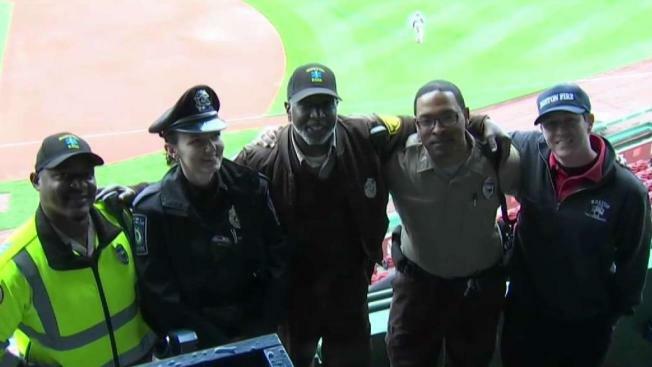 The Boston Red Sox hosted a luncheon at Fenway Park on Friday for first responders. "It's knitted in the fabric of the city — the resilience," said Boston Fire Commissioner Joe Finn, who attended the event. "And the fact that six years later, we still won't forget — we'll never forget — but we'll also be respectful of the day." Other events included blood drives sponsored by the American Red Cross. The Martin Richard Foundation, the charity named after the marathon bombing's youngest victim, is gathering various items to put together baskets for foster care children. "We're collecting ear buds, we're collecting small stuffed animals and night lights," said Terri Ladka, the charity's executive director. "And those things are for kids that abruptly get taken from their homes." The collection sites across the city include Boston Engine 33 Ladder 15, Boston YMCA, The Edward M. Kennedy Institute and City Year Boston. Donations will be accepted until April 15.